REGGIE HUDLIN PRODUCES HIS 7TH NAACP IMAGE AWARDS! The most revered black films aren’t just beloved for all-star casts or compelling plots — the soundtracks were just as pivotal. From “Do the Right Thing” to “Boomerang” and “Waiting to Exhale,” the music that scored these was just as lasting. In a salute at the Hollywood Bowl on Wednesday, beloved tracks from black cinema classics such as “Shaft,” “The Bodyguard” and “Purple Rain” received an orchestral treatment. Grammy-winning musician/composer Marcus Miller and producer/director Reginald Hudlin assembled the show, which covered seven decades of soundtracks. Clips of iconic black actors like Dorothy Dandridge, Sidney Poitier, Harry Belafonte and Sammy Davis Jr. flashed alongside current box-office draws like Will Smith, Morgan Freeman and Jamie Foxx as the Hollywood Bowl Orchestra breezed through arrangements. Bilal, Anthony Hamilton, Public Enemy, Lalah Hathaway, Princess and En Vogue all popped up to sing and Craig Robinson served as the master of ceremonies. Here are five things we learned from "The Academy Celebrates the Black Movie Soundtrack" on Wednesday. 1. Anthony Hamilton and Bilal are undervalued soul men. The instant ubiquity of the themes from “Shaft” or “Trouble Man” can’t be denied and the orchestra, led by Vince Mendoza, tackled them with soulful precision. But Hamilton and Bilal unpacked them both with a suave swagger that reminded us how underrated these guys are. Hamilton shined further when he turned the Quincy Jones-composed theme to “In the Heat of the Night” into a scorcher. 2. Maya Rudolph’s Princess needs a bigger stage. The “Saturday Night Live” alum’s perfected self-deprecating humor has already made her a screen star. But her music chops remain underappreciated outside of her fanbase. Her side-gig, a hilarious take on the rock cover band – Prince, if the band’s name didn’t tip you off – offered the night’s best laughs (apologies to the host). Rudolph and her bestie Gretchen Lieberum are like the boozy gals who turn the boring wedding reception into a rager. Their takes of “Let’s Go Crazy” and “Purple Rain” were a deliciously messy, crowd-pleasing riot, and an easy sell for a big-screen musical. 3. En Vogue’s still got it. The funky divas have gone through more changes than we dare try to count, but the ladies haven’t lost any of their signature sultriness. Their cover of the “Sparkle” classic “Something He Can Feel” was a stunner, even if all the original members weren’t there. 4. “Happy” is tired. We all love Pharrell William’s gleeful pop smash. It’s completely perfect and deserving of the accolades it’s received (there’s some Grammys likely coming its way too). The song is a global phenomenon, but we need a break from it. Williams’ hit closed the show courtesy of the night’s performers and a slate of cute kids with bright T-shirts and an endless supply of jazz hands. For a night celebrating the black movie soundtrack, capping things off with a sluggish performance of a hit pulled from a kids’ flick without a black voice in the main cast seemed odd. 5. 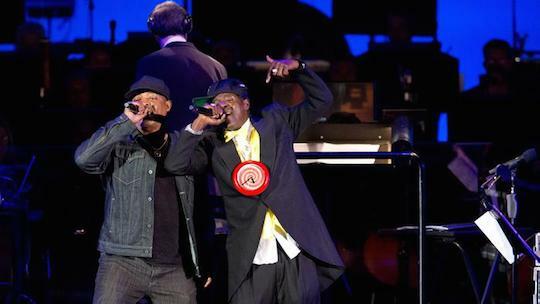 Public Enemy can rock the Bowl. Twenty-five years after its release, Spike Lee’s “Do the Right Thing” remains a crucial look at racial tensions within neighborhoods. But the film also birthed one of Public Enemy’s greatest records, “Fight the Power.” Seeing the politically charged anthem ring out at the Bowl as Chuck D and Flavor Flav worked the stage was a reminder of hip-hop’s lasting influence. But seeing the thousands of fists waving in the air to the music was a poignant reminder that the fight is long from over.